From the Warp: World's largest Apocalypse battle fought worldwide! World's largest Apocalypse battle fought worldwide! s a way of helping the guys over at Apocalypse 40k Forums get the word out about their upcoming Apocalypse battle, here's some information for those of you looking to get involved and maybe even set a record or two! On January 22nd, 2011, an Apocalypse battle will take place in five different countries over three continents and over a dozen locations in the USA. Organized by the SoCal Apocalypse club and the Apocalypse40K.com forum and titled The Big Game, this battle will be happening at all four U.S. Games Workshop Battle Bunkers, Warhammer World in the UK, Norway, Greece and various locations in the USA. 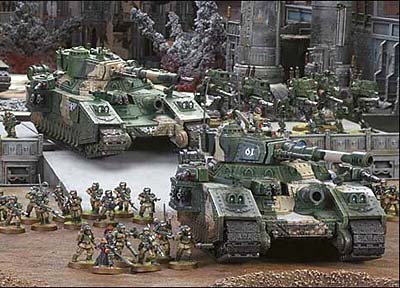 The main game will be held at the Games Workshop Los Angeles Battle Bunker, which expects to have close to a million points fighting it out over 80 sq. ft. of table space. "We have 4 of the biggest Apocalypse clubs in the USA participating in this event." says Alec Peters, the event organizer and the head of SoCal Apocalypse, the Apocalypse club that is running the event at the L.A. Battle Bunker. So not only do we have all 4 U.S. GW Battle Bunkers involved, but Siegeworld (who really started the mega-apocalypse craze) from St. Louis, Apoc-Eclipse from North Carolina and For the Emperor from Texas are all hosting games. Siegeworld will be heading up to the Chicago Bunker, Apoc-Eclipse will be hosting their game at All Fun & Games in Apex, NC and For The Emperor will be hosting their game at their facility. In addition, almost a dozen stores from around the US are joining in. "This has gotten a huge amount of traction and support in the Apocalypse community." said Peters. "James Bell, the L.A. Battle Bunker manager has been awesome in spearheading the effort with the other bunkers and promoting the event. He is basically turning over all 22 tables in his store for this event. And we will be adding more tables as we think we are going to be busting at the seams." SoCal Apocalypse started in 2009 and has taken off because of its attitude of cooperating with the other major Apocalypse clubs across the USA. "When I contacted the guys at Siegeworld, things really started to cook. Those guys are NUTS, and their games are so big they play on a warehouse floor! Siegworld came up with a system to record the biggest games of Apocalypse and so all the major Apocalypse clubs have adopted the records and we are basically setting down how you go about and beat them. The more clubs trying to beat the records the better!" Similar to the above, but models don't need to be painted, and two or more disconnected tables. Anything goes so long as it is interrelated and simultaneous. Allows for multi-location play, discontinuous tables, unpainted minis, etc. No turn requirements. The record was held by Siegeworld at 433,000 points (also the first group to play a 400k game of 40k), but was surpassed in September, 2010 at GMI Games in Riverside, CA with 520,000 points. Anything with an AV, MCs, and GCs count as one, so long as they're painted. Single battlefield as per the first record and no turn limit (Siegeworld did not break this record) GW Manchester UK holds the title with 2,562 models. See Most Points in a Single Battle. Same restrictions apply. This record is anything goes so long as it is interrelated and simultaneous. A miniature is counted as any piece which has its own base or does not use a base. Essentially, if it can be moved on its own (thus a swarm base is a single miniature). Siegeworld is the current holder of the record, at 6,500 minis done in St. Louis MO. on 8/14/10. "Teacher says, every time there's an Apocalypse battle, a GW executive rubs the One Ring." Is there a site to go to to see if a store near you is participating? Gothmog, the apocalypse40k.com site has a section for locations to register. It lists all of the stores that are participating. Cheers Ron, once again you've guided me to another corner of the 40k community that I would have otherwise have blundered past. Just to Clarify, Siegeworld will be hosting in Saint Louis as opposed to heading to Chicago as we were able to get a location locally.